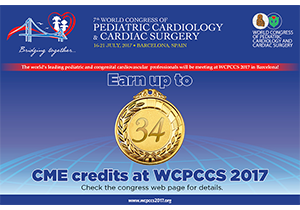 The aim of WCPCCS is to bring together all professionals involved in the care of children’s heart disease and congenital heart disease of all ages, from the fetus to the aged. The Congress will provide a unique opportunity to meet the leaders of specialties worldwide; to learn about the latest innovations and the results of procedures; and to contribute to the discussions, debates and plenary sessions with renowned speakers. The central philosophy of the Congress is “bridging together” all major specialties in the field. Accordingly, the scientific program is carefully planned to address all interests and expertise with concentration streams on pediatric cardiology, pediatric cardiac surgery, adult congenital heart diseases, anesthesia, intensive care and nursing. We are excited to offer the scientific and cultural feast of a lifetime to one of the most refined crowd in the profession, in one the most welcoming, inimitably exciting venues of the world. Come to Barcelona in July 2017 and join us in forging this unforgettable experience. Let’s meet in Barcelona in July 2017!